1 of 4 In a bowl, combine beef, shallot, 2 minced garlic cloves, 1 tbsp gochujang, 2 tsp ginger, 1 tsp sesame oil and the salt. 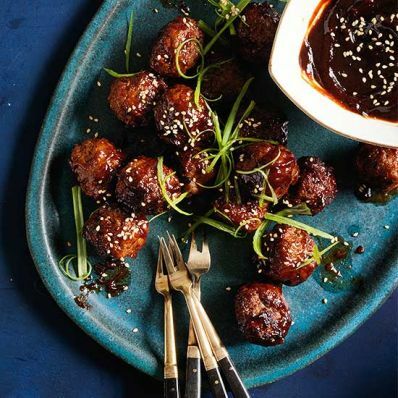 Roll into forty-eight 1-inch meatballs. 2 of 4 In a large skillet, heat 1 tbsp vegetable oil over medium-high. Add half the meatballs. Cook 2 minutes; turn and cook 1 minute, until browned (meatballs don't need to be cooked all the way through). Remove to a paper-towel-lined plate. Add 1 tbsp vegetable oil and repeat with remaining meatballs. 3 of 4 Reduce heat under the same skillet to medium. Add 1 minced garlic clove and 1 tsp ginger; cook 30 seconds. Add ketchup, brown sugar, vinegar, 1 tbsp gochujang and 1 tsp sesame oil. Whisk until blended. Bring to a simmer, then reduce heat to medium-low and simmer 5 minutes. 4 of 4 Return meatballs to skillet. Simmer in sauce for 5 minutes. Transfer to a serving bowl and, if using, scatter sesame seeds and scallions on top. Serve with toothpicks or cocktail forks.